What's business planning all about? Why bother? But Why Would You Plan Your Business If You Don’t Have To? What’s business planning all about? Why bother? Why would a company that doesn’t strictly have to do a business plan want one? What are some of the myths associated with business social media, and how can you get business ROI in social media? 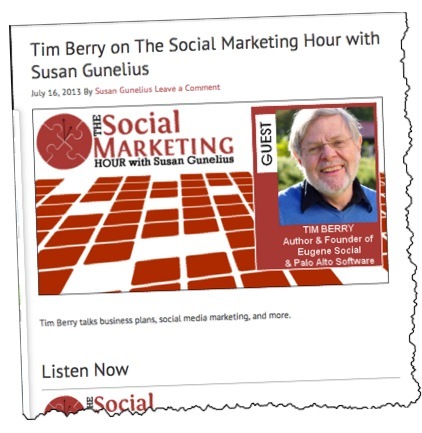 These are some of the issues Susan Gunelius and I talked about yesterday on Tim Berry on The Social Marketing Hour with Susan Gunelius — The Social Network Station. That’s Susan’s podcast. Tools to help you create business plans and execute your social media marketing strategy, including Bplans.com, HootSuite, Buffer, and more. So I hope you find it useful. Just click the link to listen to this podcast. Hint: The reason you want a business plan for your business, and for any business, is that it makes for better management—set down tracks and follow up. It’s to manage change. And we all know that change comes faster now than ever.